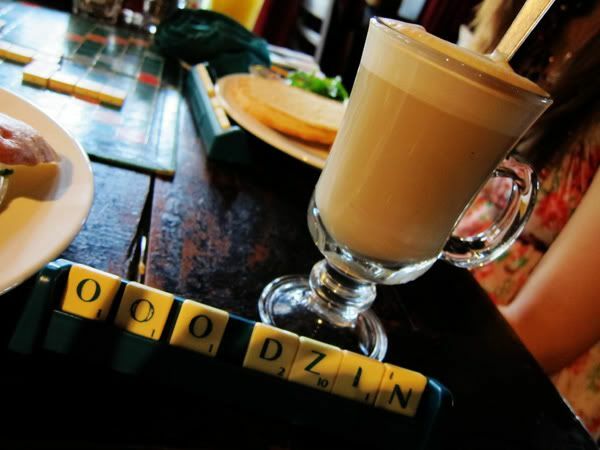 Revel in me...: Scrabble brunch. The foliage and the animal print makes me feel like a prowling wild animal, rawrrr. I was feeling quite under the weather that day, and was looking quite pasty and pale... So I did the best pick-me-up I could for my face-- a touch of red lipstick! 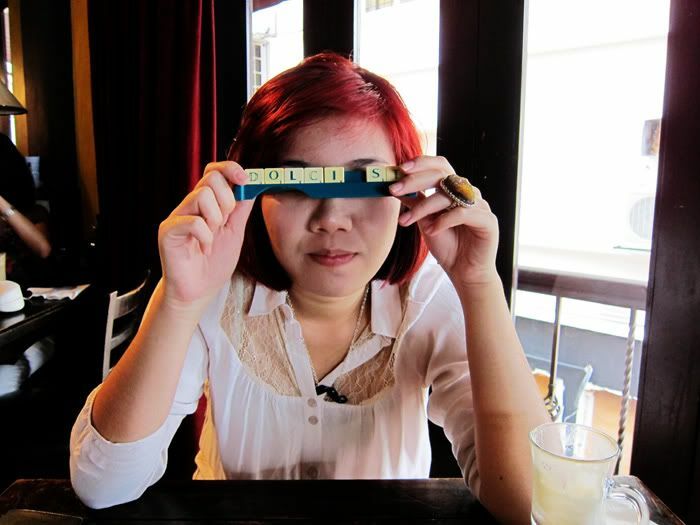 We had Scrabble + brunch,where I tried to muster as much excitement (and brains) as I could despite my sniffling nose. Miss my beard woman! She'll be back with me in 2 days, yay! The lousiest set of alphabets. The only words I could think of is 'POO' or 'GOO'. Or 'NOOOO', y'know, like if you fall off a cliff. Dolci means desserts (or sweet) in Italian, and we told Teeny this is a sign of GOD that given her passion for desserts, she should pursue her interest! And for all you people who roll your eyes and do the 'Speak to the hand' gesture whenever I say I re-wear my clothes... I've got evidence that I do!! Wearing the same H&M shirt in Seoul last year. 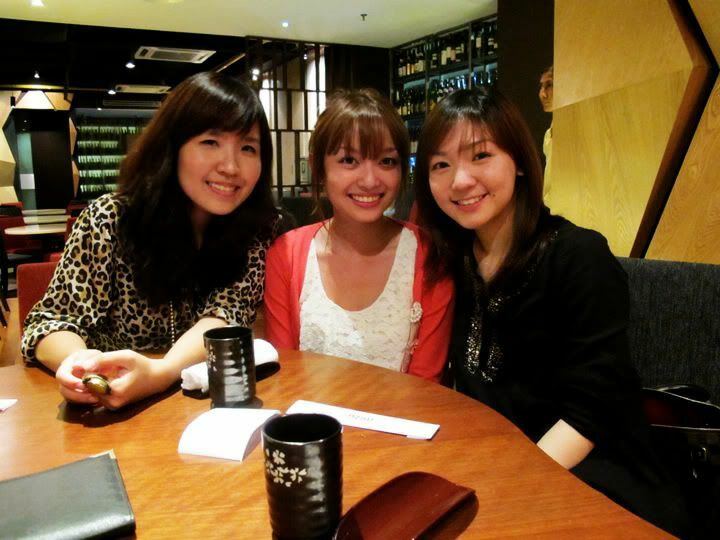 Dinner with Audrey and Jiameei. ...which incidentally, I was severely ostracised. I had a foul start to my day despite the beautiful rainy lazy weather, now all I want to do is to lie in my bed and hide from the world. The red lips sure did the trick :) How do you keep the lipstick from staining your teeth? 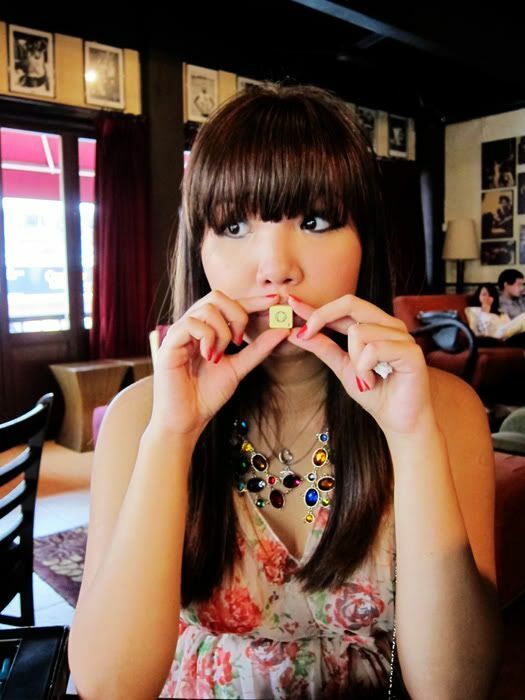 i like ting's mustache necklace! can i know where she bought it from? 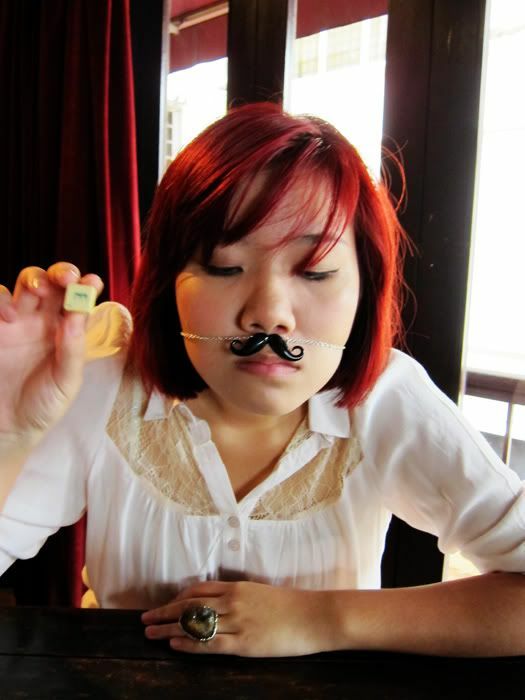 anonymous: She got it from Melbourne if I am not mistaken! Waitttt isn't that thing on sister Ting's lips a mustache and not a beard?? LOL grammar Nazi. Love your leopard print shirt..you look so exotic wtf that's a good thing! don't know why i look like an aunty if i wear animal prints & red lipsticks but you don't! ms hoe hui wen, i'd like to inform you that wearing the same top a year apart is NOT rewearing your clothes okay -_- us lesser mortals have to rewear our clothes every other week.